The event was highlighted by key note speaker Shawn Long. Long is a former high school star at Grandview winning the second Simone award in 1984. He spoke to the group about treasuring and using time wisely as they move forward in their lives. 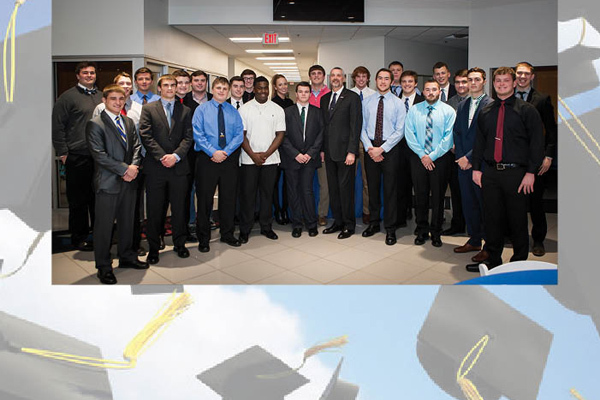 The McCarthy Auto Group has provided the funds for the 22 scholarships for the last 10 years. Jacob has earned a 4.833 GPA while scoring a 30 on his ACT and is currently ranked third in a senior class of 329. He was named the team MVP this past season for the Pioneers earning honorable mention honors from the Sunflower League and third team all-state from the Kansas Football Coaches Association. Jacob has also participated in wrestling and track and was a team captain for football and wrestling. He has been a member of the honor roll all four years at Leavenworth and has earned several other awards such as the school wide math championship. His head coach Mark Littrell said of Jacob – “I have been Jacob’s head football coach for four years and the impact that this young man has made on our football program is outstanding. Jacob has always exhibited leadership both on and off the field.” Jacob will attend West Point where he will walk on to the football team. Cole currently has a 4.0 GPA, scored a 24 on his ACT and is ranked first in his senior class of 344. This past season he was named first team All-Sunflower League along with all-state honors by Kpreps.com, Kansassports.com and KickerU.com. He also participates in soccer and golf. In the classroom, Cole, has been on the honor roll all seven semesters, on the Principals list, is a member of the National Honor Society, student leadership team and works with special needs students. His head football coach Dirk Wedd said of Cole – “Cole represents one of the best and brightest student-athletes that Lawrence High has to offer. Beyond his academic and athletic achievements.” Cole will attend KU where he will play football. Cale currently has a 4.67 GPA, scored a 35 on the ACT and ranks ninth in a senior class of 495. He was a leader for the Jaguars earning the Tyler Tayrien Mr. Jaguar award this past season. Cale was also all-conference, Examiner All Area, first team all-state and is a two-time academic all-state. He also plays basketball and baseball. Cale’s other activities include student senate, student ambassadors, FBLA, DECA, NHS and FCA. His head football coach Jon Oyler said of Cale – “He has shown during his time at Blue Springs South all of the characteristics in the classroom and the playing field that you want every student athlete to exhibit; work ethic, leadership, resilience, strong moral character and self-sacrifice.” Cale is undecided on his school choice but plans to study business finance. Danny currently has a 4.019 GPA, scored a 25 on his ACT and is ranked sixth in his senior class of 325. This past season he was named honorable mention all-conference and earned academic all-state for the second straight season. He also participates in wrestling and golf. Danny is also a member of the National Honor Society, the Raytown International Club, the National Society of High School Scholars and earned Raytown’s Academic Excellence Award. He is a member of his church youth group and the Greater Kansas City Officials Association. His head football coach Kevin Page said of Danny – “Danny is the type of person you are happy to have represent your school. He is an excellent student, is never a discipline problem and competes at the varsity level in two sports. Additionally, Danny is active in multiple organizations at Raytown High School.” Danny intends to play football at the University of Central Missouri and then work in youth sports after his playing career. Forest currently has a 3.857 GPA while scoring a 28 on his ACT. He finished his senior year as a first team all-district and honorable mention all-conference player. He is also a member of the National Honor Society, DECA, Spanish club and Youth Core. Forest has also been on the honor roll all four years of high school. His head football coach Kelly Donohoe said of Forest – “I have been fortunate in my 24 years as a high school educator and coach to have worked with many fine students. There have been none finer than Forest Dodge. Forest is a tremendous representative of Blue Springs High School. He exemplifies the type of student-athlete worthy of this tremendous scholarship.” Forest will attend Central Methodist where he will play football. Colin currently has a 4.2 GPA, scored a 29 on his ACT and is ranked 33rd in a senior class of 200. He finished his football career as a four-year starter on a Stags team that won three state championships. Colin was all EKL, All-Metro, All State the last two seasons and was a finalist for the Bobby Bell award as a senior. He is also a member of the track team. Colin is also a member of the National Honor Society. His head coach Jon Holmes said of Colin – “I am proud to see the man Colin has grown into. He works extremely hard and is appreciative for his opportunities. He is going to be successful in whatever he decides to do in life.” Colin will attend and play football at the University of Notre Dame. Warren currently has a 4.822 GPA, scored a 33 on his ACT and ranks third in his senior class of 436. This past year he was honorable mention all-conference and academic all-state. Warren is also a member of the wrestling and track teams. He is a member of the marching and symphonic band, National Honor Society, National Spanish Honor Society, Tiger Mentoring and a member of the Principal’s Honor Roll for all four years of high school. His head football coach Eric Thomas said of Warren – “Warren is a great example for others of what a student athlete at Lee’s Summit High School should look like. Warren’s contributions to Lee’s Summit High School in scholarship, citizenship and athletics are numerous.” He will be attending the University of Missouri where he will study biological science. Nicholas currently has a 94.73 GPA and a 29 on the ACT. He finished his senior year with second team All EKL along with all-state honors from the Kansas Football Coaches, The Topeka Capital Journal and Wichita Eagle. During his time at St. James, Nicholas has participated in wrestling, track, powerlifting and Rugby which he helped to found. He is also a member of the National Honor Society, First Honor Roll and the Men of St. James. St. James Athletic Director Mark Huppe said of Nicholas – “Nick has consistently shown tremendous character and integrity in all that he does at St. James. He leads verbally and as a role model, especially to the underclassmen.” Nick will attend Kansas State and study engineering. Peter currently has a 4.33 GPA, scored a 28 on the ACT and ranks 39th in his senior class of 372. He was named first team all EKL and first team all-state by every publication in Kansas. Peter has also been named academic all-state all four years and has had a 4.0 all through school. He is a member of the National Honor Society. His head football coach Andy Sims said of Peter – “Peter has been a major part of our program’s success these past three seasons. On the field, he has started since his sophomore season and served as a team captain. Off the field, his leadership and dedication to academics has been second to none. The amount of time, effort and energy he has put into his academics is exactly what you wish for out of every one of your players and even your own children.” Peter will continue his football career at the University of South Dakota where he will study Pre-Med. Luke currently has a 3.945 GPA, scored a 23 on the ACT and ranks 29th in his senior class of 175. He was named first team all Kaw Valley League, second team all-Metro and honorable mention all-state this past season. Luke has also been a member of the Bobcats’ baseball, basketball and powerlifting teams. In the classroom, he has earned two academic letters and is a member of the National Honor Society. His head football coach Rod Stallbaumer said of Luke – “Luke is one of the most respectful, grounded and coachable athletes I’ve had. He is a great role model for our program and a great representative of Basehor-Linwood High School and Bobcat Football.” Luke will play football at Missouri Western this fall. Jesse currently has a 4.18 GPA, scored a 23 on the ACT and is ranked fifth in his senior class of 147. He was named Power Jacket Award winner, earned first team all-conference, all-district and academic all-state the last two seasons. Jesse is also a member of the wrestling and baseball teams along with the marching band. He is a member of the National Honor Society, Student Government Association and is a Student Ambassador. His head football coach Bryan DeLong had this to say about Jesse – “As a coach obviously, Jesse’s leadership on the playing field and in the weight room are priceless when it comes to the success of our program. But it is what Jesse does away from the playing field that holds as much value for our program in our young players seeing someone they look up to serve as a true leader both in the classroom and on the playing field.” Jesse is still deciding on a college. Max currently has a 4.3 GPA, scored 25 on the ACT and is ranked ninth in a senior class of 89. On the field, he was an all-conference, all district and all state performer as a wide receiver and defensive back. Max also plays basketball and baseball where he has earned all-conference. He has been on the Superintendent’s Honor Roll all four years, been named a Conference Scholar Athlete and earned academic letters of excellence. Max is a member of the National Honor Society, student council and senior class president. His head football coach Todd Dunn said of Max – “I have known Max for his entire life as a player, student and friend of our family. I have had the pleasure of watching him grow from a kid to a responsible young man. Max has grown a great deal in the past four years both as a player and as a young man. He is a very unselfish player and his number one objective was always to make the team better.” Max is going to attend Northwest Missouri State for either baseball or football. Cornelius Ruff currently has a 4.0 and is fifth in a class of 194. He led Schlagle to one of its best seasons in years while leading the state of Kansas in rushing. Cornelius also set the Schlagle career rushing and touchdown record on his way to being named all-conference and all state. He has been on the honor roll every semester, is a member of Boys State and volunteered at Harvesters. The Lead College and Career Coordinator for the Kansas City, Kan. Public Schools Diamond Howell said of Cornelius – “His determination to be the best student-athlete that he can be has manifested itself in great success. This year he was presented with a number of potential scholarship offers to colleges based upon his academic record alone. He is an incredibly hard working young man who is focused on achieving his postsecondary pursuits.” Cornelius will attend and play football at Kansas State. Will currently holds a 3.2 GPA and scored a 24 on the ACT. This past year he was the Indians’ varsity football MVP, named first team all-Sunflower League, all state and was a finalist for the Simone Award. Will also plays basketball and baseball. He has been on the honor roll, was named a scholar athlete, been vice president of the student council and a part of the Freshman Mentor program. Will’s head football coach Ben Bartlett said of him – “He has simply been exemplary these last four years serving his team, school and community. He is beyond a doubt a student athlete of great character worthy of scholarship.” Will is going play football at William Jewell. Hunter currently holds a 3.75 GPA, scored a 28 on the ACT and is ranked 65th in a class of 347. This past season he was the Northmen’s defensive MVP, elected team captain, named honorable mention all-conference and academic all-state. Hunter is also a three-time state finalist wrestler winning the Class 3 152-pound title as a sophomore. He is a member of the National Honor Society and a youth wrestling club coach. Hunter’s head football coach said of him – “Hunter is not your typical kid. He loved the sport – truly loved it. He loved the comradery, the locker room, the guys.” Hunter will attend South Dakota State where he will wrestle. Bennett currently holds a 4.0 GPA, scored a 25 on the ACT and is ranked first in a class of 396. On the field, he was named first team all-conference, all district and all state. He has won the Blue Jay Elite Award which combines academics, involvement in school activities, the community and work in the football program. Bennett also has played baseball and lacrosse at Liberty. He is a three-time academic all-state selection and a member of the National Honor Society. Bennett’s head football coach Chad Frigon said this about him – “Bennett is an athlete who is dedicated to be successful and committed to play to his potential in everything he does. Bennett consistently makes those around him better. He pushes his teammates on and off the field. He has an inner drive for himself that radiates to those around him.” Bennett will attend Truman State and play football while pursuing a business degree. Kole currently has a 3.9 GPA, scored a 24 on the ACT and is ranked ninth in a class of 273. This past year he was named the Eagles’ defensive MVP, Rupp and Napier Award winner, first team all-conference and all district and Examiner All Area. He has been named academic all-conference in track and football and academic all-state. Kole is also a member of the national honor society and taken part in fundraisers like the Polar Plunge for Special Olympics. Grain Valley head football coach David Allie had this to say about Kole – “I have had the pleasure of knowing Kole for the past three years at Grain Valley High School. His determination to succeed transcends that of most adolescents and because of this, as well as his willingness to do whatever it takes to accomplish the task required of him, he is recognized as one of the finest leaders in our school.” Kole will attend and play football at William Jewell. Landry currently has a 4.27 GPA, scored a 29 on the ACT and ranks 38th out of 198 in his graduating class. This past year he was named first team offense and defense in the EKL as well as being named the league’s special teams’ player of the year. Landry was also a first team all-state selection. In addition to football he was a member of the Stags state championship basketball and track teams from last year. In the classroom, he has been on the honor roll all four years, is a member of the National Honor Society and won the Bishop Miege Academic Excellence Award. Landry’s head coach Jon Holmes had this to say about his achievements – “Landry was a key player during the most successful run in Miege football history. During the 2014-2016 seasons, we won 37 games and lost two. Landry helped lead us to two EKL titles and three state titles during that run. He is the hardest working player I have coached. There was not a challenge Landry could not complete.” Landry will attend and play football at Kansas State. Keegan currently has a 3.875 GPA, scored a 26 on the ACT and ranked 17th in a class of 350. He was a member of the Jaguars football leadership council and a team captain on a team that won its second straight Kansas Class 5 championship. He was named first team all EKL, second team all-Metro and first team all-state. Keegan has been on the honor roll for two years and a junior Jaguar volunteer. His head football coach Joel Applebee had this to say about Keegan – “I’ve had the pleasure of coaching Keegan the past three years at Mill Valley. He is an excellent student athlete who is looked up to as a leader. Keegan displays a high degree of integrity, responsibility and ambition on the field and in the classroom.” Keegan will attend and play football at Missouri Western. Joe has been a football manager for the Thunder for the last three seasons. He had an older brother who played football but due to a brain bleed when he was six was left with weakness on his left side and in his left hand. Since the injury, he has had more than eight surgeries and wears an electronic leg brace to help him walk. Even with these challenges, he wanted to be a part of the football program at St. James and be around his older brother Sam who is a player on the team. Joe is an integral part of the team never missing a morning workout and giving as much effort as the players. St. James coach Tom Radke had this to say about his inspiring team manager – “He has a tremendous work ethic, never misses a workout, and gives 100 percent effort in all he does. Joe would do anything for his teammates and exhibits true leadership, never hesitating to call out players that may not be giving as much effort as he knows they are capable of. He does all of these things knowing that he cannot play the game he loves, like his big brothers got to. He is a remarkable young man, I could only hope to have all of my own children exhibit his determination and character. God has Blessed St. James Academy with Joe's presence at our school.” Joe is considering becoming a football team manager in college.